Most brands, and indeed agencies, implement traditional outbound marketing campaigns. These usually take the form of interruptive campaigns and content about a brand, product or service, disseminated through PR, social media, blogs, advertising, online and via other traditional marketing communications channels. The aim of course is to influence opinion and stimulate a response...but marketing has now changed. Inbound marketing is central to this modernisation, as it works entirely differently. Instead of reaching out with sales-led ‘buy me now’ marketing pitches, VIViD tailors campaigns and content to your potential customers’ specific needs, based on what they are actually searching for on the Internet. And in doing so, you differentiate your approach and attract them to your website as an incoming prospect that is nurtured into a lead and finally into a customer. This process is proven to increase business by 33%. Inbound marketing works because the majority of people search online for solutions to issues, answers to questions and for inspiration and ideas. Inbound content marketing campaigns target these searches directly by providing the answers, solutions and information that people are looking for. After creating downloadable content, we then launch related content campaigns to take website visitors on a journey that converts them into a customer. The process of providing value-content tailored to their needs is proven to boost sales and customer acquisition by 33%*, so if you feel traditional marketing provides the fast route to immediate sales, perhaps it's time to re-think your approach. Traditional marketing is based on your priorities and your need to sell now - not the customers' need for information, value content and help in making their buying decision. Whilst the end aim is the same i.e. to grow sales and market share, Inbound marketing provides a more intelligent, subtle customer-orientated way of delivering results. Speak to VIViD, and whilst the majority are continuing down the traditional route, competing for the attention of audiences and demanding an immediate sales choice, you could be the smarter marketer and get to the hearts and minds of your prospects. Trust us, you'll win their wallet too! VIViD is at the forefront of this phenomenon, and we're one of the first UK consultancies to offer Inbound marketing solutions. We provide this service as a Certified Partner of HubSpot, one of the world’s leading and most sophisticated Inbound platforms. VIViD builds remarkable content campaigns and automated follow-ups based on your ideal customer personas and can guarantee to increase website traffic, generate prospects and leads, build customers and ultimately revenue*. If you want to increase leads for your sales team and boost revenue for your business, this is just what you’ve been waiting for. 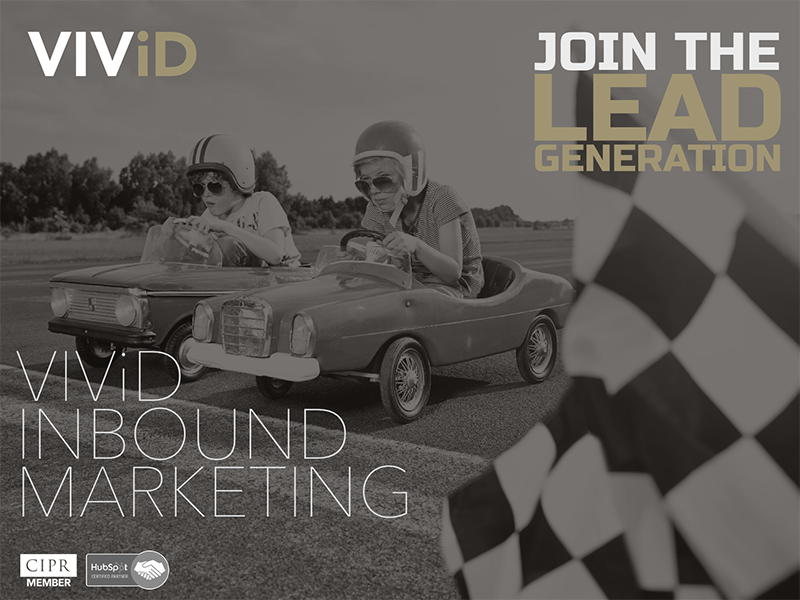 Call 01372 476 362/3 or email info@vividpr.co.uk today to discover how Inbound Marketing can bring a transformative new dimension to your campaigns and ensure you gain a genuine competitive advantage in the saturated, big-brand dominated online landscape?